After hearing from Zach Menchini on his starting five I have a few points I'd like to add. Mainly, I disagree with Mookie Jones starting. Mookie Jones didn't show much last season other than his ability to knock down shots from beyond the arc and the ability to piss off the coaching staff demanding playing time. I agree with Zach on the four he predicted. Rick Jackson and Kris Joseph at forward and Scoop Jardine with Brandon Triche at the guard spots. However I think if Fab Melo is not ready to start come November 12th, DaShonte Riley will get the nod to start at center. With Mookie Jones starting our center would be 6'9" Rick Jackson. While I know our early non-conference schedule isn't very daunting I don't think Jimmy B will go with Mookie Jones up front when he can put the 7 footer Riley in the middle and move Jackson to the wing to add three more inches on the edge of the zone. Mookie Jones also likes hanging out around the perimeter of the offense and Syracuse will need the size upfront rather than hanging out along the three point line a la Donte Greene during his tenure at the cuse. DaShonte Riley did look lost on the court during the NCAA tournament when he filled in for injured Arinze Onuaku, however he will be a year older and a year wiser from that experience. One thing we should all remember is the progress Kris Joseph made between his freshman and sophomore year. Kris Joseph looked lost on the floor in his freshman year, he was afraid to dribble the rock it seemed! However, look at how he came flying (literally) out of the gates in his 2nd year with the team. I'm not predicting a similar jump in performance from Riley, but as long as he settles down in the same manor that Joseph did he will be more than fine holding down the center position until Fab Melo fully adjusts himself to the college game. Off the bench Syracuse will be stocked with talent. Along with Mookie Jones' shooting ability they will have freshman Dion Waiters ready to explode off the bench as well as C.J. Fair and James Southerland. James Southerland has a great shot and a long wingspan which will look great atop the 2-3 zone. This will be the best bench Syracuse has had since possibly the 2003 season. Syracuse with 9 serviceable players? The Big East better WATCH OUT! In terms of overall team performance this season, my prediction on the last day of September is a 23-8 record for the regular season. Last year the Syracuse Orangemen ran right through the regular season earning the #1 spot in the Big East tournament and a 1 seed in the NCAAs. Without the leadership and defensive hustle of Andy Rautins I honestly don't see the team blowing through a very difficult Big East conference with the same gusto they had last year. 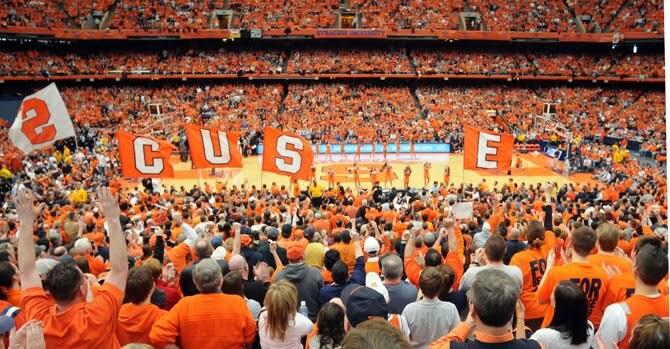 If Syracuse finishes with a conference record of 13-5 they should be very well situated for a solid run into the NCAA tournament. This is a very realistic expectation for the 2010/11 season. 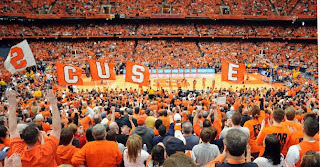 Will this be the year the Orangemen finally break through the Sweet 16? We'll have to stay tuned to find out. As we've said before, the 5th spot will all depend on who made more offseason progress. I think Mookie was a step ahead of Riley at the end of 09-10, so he's a slight favorite, IMO. yeah it will be an interesting training camp for sure! can't wait to see how the freshman fit into the orange system..
Nice blog fellas, I will get a link up on our site tonight. I think the 5th spot goes to Melo. Jimmy B said this off-season he thinks he'll be one of the tops freshman in the country, he he doesn't offer high praise like that too often. you're right jimmy b doesn't give praise unless its deserving, but i dont think he will be ready to start november 12th. fab melo only has 1 year of american basketball under his belt and while i think he will get minutes early he wont be a full fledged starter until we're up to the conference schedule. of course there's always the chance fab melo steps in and is an absolute beast, takes the starting spot, wins national rookie of the year honors and goes top 10 in the NBA draft in 2011. thats why we watch. rivman i'm excited for fair off the bench too waiters may be a better scorer this year but you gotta be excited for a lefty. i'm not so much comparing the two, but suggesting that the lineup is flexible enough to accommodate both options: small and big. Delone Carter Running Through the Record Books! Welcome Everybody to the Ryan Nassib Show!! Jack Cosgrove: The poor man's Jim Boeheim? HI! I'm Earth. Have we met? And now we're gonna party like its 2003!! !